The Trouble with Harry is that he's dead, and while no one really minds, everyone feels responsible. While the work of Alfred Hitchcock often displayed his droll, dark sense of humor, 1955’s The Trouble With Harry offered a more overt entry in the “black comedy” genre. 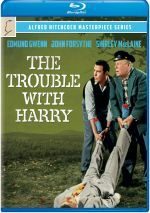 Harry starts with a death, as it appears that Captain Albert Wiles (Edmund Gwenn) accidentally shoots Harry Worp (Philip Truex) during a hunting outing. He plans to simply hide the corpse and not notify anyone, but a variety of locals find the body before he can do so, and that makes it impossible for Wiles to neatly dispose of Harry. Oddly, none of these folks seem too upset about the departed. Some – like Jennifer Rogers (Shirley MacLaine) exhibit outright happiness about his death, while others remain simply unconcerned. Struggling artist Sam Marlow (John Forsythe) uses Harry as a model, while aging spinster Ivy Gravely (Mildred Natwick) turns her discovery of Captain Wiles’ deed into an excuse to invite him over for a snack. Inevitably, complications arise, primarily connected to the cause of Harry’s death. Did he die due to Captain Wiles’ gun or did something else occur? The film explores that path along with connected issues. My opening paragraph may make Trouble sound like it differs from the usual Hitchcock flick more than it actually does. Yes, the film provides more obvious comedy than most other Hitchcock works, but it’s not like Hitch made something akin to Weekend At Bernie’s. Though the humor becomes more prevalent here, the material remains dark and dry; this isn’t a broad laughfest. And that’s good, because we don’t want Hitchcock to stray too far from his bread and butter. 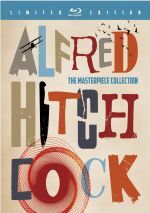 By no means do I view Hitchcock as a one-note filmmaker, as we find substantial differences among most of his films. However, virtually all of Hitchcock’s works fall under the “thriller” banner, and I don’t think he’d have been well served if he tried to stretch his legs too much. Hitch clearly understood where his talents resided, so he created variations on similar themes within the same genre. A more traditional comedy from Hitchcock probably would’ve been a disaster; he remained uniquely suited for dark material like this. In fact, the creepiest part of Trouble comes from the romance between Albert and Ivy. I know she’s supposed to be a desperate spinster, but Gwenn was way too old for Natwick. Strangely, the movie portrays Ivy as 42 even though she looks much older. Natwick was actually 50 at the time, so why not use her real age? In any case, Gwenn was pushing 80 back then, so the concept of those two as a couple doesn’t seem too appealing for an audience. Gwenn played Santa eight years earlier, and now he’s romancing a much younger woman? Ick! The Trouble With Harry appears in an aspect ratio of approximately 1.85:1 on this Blu-ray Disc. I didn’t expect much from this transfer but found it to offer a pleasant surprise. Sharpness was quite good. Only a smidgen of softness ever interfered in some wide shots; the majority of the film offered strong clarity and accuracy. No concerns with jagged edges or shimmering occurred, and edge haloes were minimal. In terms of print flaws, I noticed occasional instances of tiny specks but nothing severe. Most of the time, I thought the film’s hues were vibrant and rich, and they suffered from no bleeding, noise or other issues. A couple of shots could be a little flat, but most demonstrated lively, vivid autumn tones. Black levels occasionally looked a smidgen blue, but they were usually fairly deep, and shadows were effectively displayed. Low-light images looked clear and appropriately opaque, though some “day for night” shots meant that nighttime elements looked “off”. Despite a few concerns, the image deserved a “B”. I found the monaural soundtrack of The Trouble With Harry to work fine. It didn’t exceed expectations for a mix of its age, but the audio was more than acceptable. Speech lacked edginess. The lines weren’t exactly natural – many showed obvious looping - but they seemed distinctive and without problems. Effects were a little flat, but they showed no distortion and displayed acceptable definition. Music was pretty lively given its age, as the score sounded reasonably bright and concise. All together, I found little about which to complain, as the soundtrack aged well. How did the Blu-ray compare to the last DVD from 2005? Audio was pretty similar; the lossless DTS-HD track might’ve been a little clearer, but it didn’t show notable improvements. On the other hand, the visuals looked radically more concise and vibrant. The picture quality demonstrated a substantial step up. The Blu-ray duplicates most of the DVD’s extras, and we start with a documentary called The Trouble With Harry Isn’t Over. This 32-minute and six-second piece provides the standard mix of movie snippets, archival elements and interviews. We hear from director’s daughter Pat Hitchcock O’Connell, associate producer Herbert Coleman, screenwriter John Michael Hayes, Bernard Herrmann biographer Steven C. Smith, and actor John Forsythe. “Over” looks at the source novel, its adaptation, and the project’s path to the screen, Hitchcock’s working style, cast and performances, shooting in Vermont and sets, the score, and the movie’s reception. The biggest disappointment about “Over” comes from the absence of any actors other than Forsythe. Shirley MacLaine and Jerry Mathers are still with us, so it’s too bad they didn’t participate. Nonetheless, “Over” offers a fun look at the flick. Forsythe contributes a few amusing anecdotes about Hitchcock, and the program proves to be a breezy and informative piece. Although we get a trailer for Trouble, it most definitely isn’t the film’s original theatrical ad. Instead, it’s a promo for a home video release – and not a very interesting one. Under Production Photographs, we see 38 images. These mix ads, publicity shots and behind the scenes pictures. Though a little more comedic than most Hitchcock flicks, The Trouble With Harry marks enough of the director’s hallmarks to still feel like one of his works. We find a skewed mystery that rarely cares about what happened to the titular victim, and it becomes an enjoyable experience. 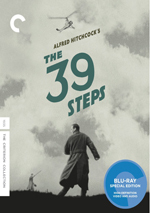 The Blu-ray delivers strong visuals, acceptable audio and an interesting documentary. I wish the set had a broader set of supplements, but I feel pleased with the presentation of the film itself. 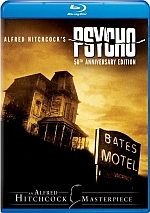 Note that Harry can be purchased on its own or as part of a 15-film set called “Alfred Hitchcock: The Masterpiece Collection”. This also includes Shadow of a Doubt, Saboteur, Rear Window, Shadow of a Doubt, Rope, Rear Window, The Man Who Knew Too Much, Vertigo, North By Northwest, Psycho, The Birds, Marnie, Torn Curtain, Topaz, Frenzy and Family Plot.